Xard777 MACD with Slope Trading System is an trend following intraday strategy. Idea beig to trade off the high/low line in the opposite direction of the orange filter line. Also make sure you are on the right side of the MACD. Currency pairs: majors and metals and Oil. - additional confirmation by candle color to be pale blue. MACD below zero line and crosses down. (Sell Zone Magenta color). 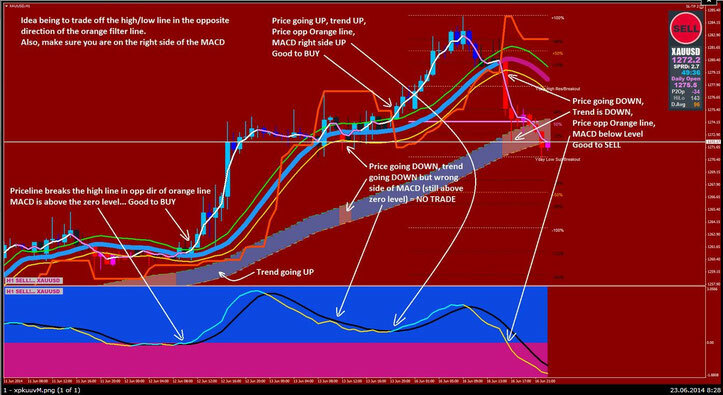 Initial stop loss 4 pips above or below Orange line. Manage position with the expert Advisor in attach. In the picture the Xard777 system in action.